Libman dust mops have an extra large, 36" x 5", 100% cotton dust mop head with 1-3/4" cut-end fringe for great dust grabbing. Zipper opening for both easy and sturdy mop head replacement. 1" sturdy steel handle and 5" grip. Total height of 65". Designed for a commercial and industrious use on all hard surfaced floors covering large areas in no time. Machine washable in mesh net bag. 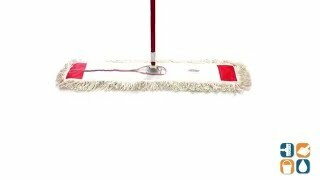 Libman 36" Dust Mops, sold by the case, 6 per case. Refills available at part# LIB-00925.